Facebook has announced the launch of first-of-its-kind Augmented Reality (AR) tool for small and large businesses which will help them connect with the 1.3 billion people who use Messenger every month. 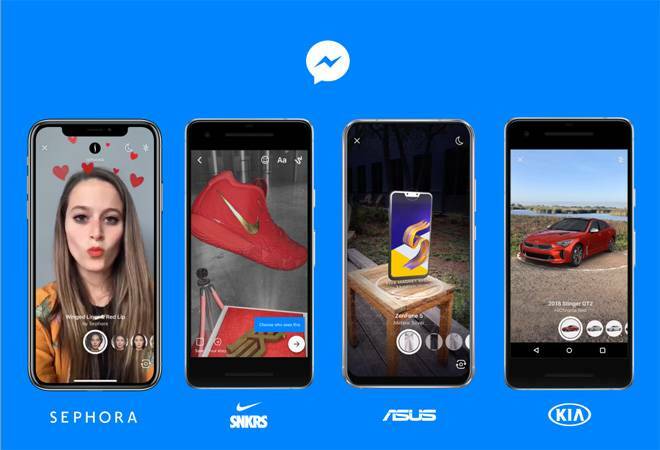 Facebook announced the launch of a first-of-its-kind Augmented Reality (AR) tool for small and large businesses which will help them connect with the 1.3 billion users who use Messenger every month. Vice President of Messaging Products, David Marcus said in a blog on Tuesday that whenever any person wants to connect to a business, he/she can get a tour of the products using augmented reality. Once the user reaches the product page on the Marketplace, they will be prompted to open their camera. The camera comes loaded with filter and AR effects related to the brand or product. Facebook claims, this is made possible by enhancing the "Camera Effects Platform" which will make the Messenger experience special with integrated AR. Later, people can share the demo on their story, either as images or video or they can simply save it to their camera roll. Marcus also cited the presence of over 300,000 active bots on Messenger and that over 8 billion messages are exchanged between people and businesses every month. Initially, this new feature will be launched for products by ASUS, Kia, Nike and Sephora. Along with such features, Facebook also introduced "M Translations". This feature can be used for better experience in its Marketplace. Buyers and sellers will now be able to do away with language barriers. If the app detects any language other than the default setting, it will ask the users if they would like to translate the message sent by the buyer or seller. M Translations will initially be capable of English to Spanish translation and vice versa, in Marketplace conversations taking place in the US. Facebook will gradually begin "M suggestions for translations" in other languages in different countries.